We humans are faced with an interesting problem: That which we think we un- derstand the most-our own behavior-we probably understand the least. On the eve of a new millennium. the planet is beset by a host of problems that are. for the most part. caused by human behavior. Ironically. although it seems that the greatest impact of our behavior is on the planet and its other inhabitants. we may actually be threatening our own future the most. For example. we have caused untold harm to the air we breathe. to the water we drink. and. by exten- sion. to much of the food we eat. More important perhaps. we have created a so- ciety in which. among other things. many people are anxious and depressed. young women starve themselves. and alcohol and cigarette use are responsible for hundreds of thousands of cases of illness and death every year. And humans still murder one another at an astounding rate. while at the same time continu- ing to affirm the value of human life. At a time when it is critical that our chil- dren become educated. more and more children are not learning the basic skills they will need to think logically so that they can begin to solve the world's problems. The question may be not "Can the planet survive?" but. rather. "Can we humans survive and change our own destructive actions?" Although many scholars. philosophers. 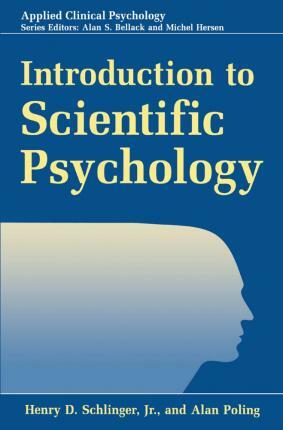 Illustrations note XIX, 388 p.
Scientific Psychology. Historical Origins. Science and Psychology. Research Methods. Behavioral Causation. Phylogeny: Evolution and Behavior. Ontogeny: Classical Conditioning. Ontogeny: Operant Conditioning. Neurophysiology and Behavior. Applications of Scientific Psychology. Language. Cognition. Human Evolutionary and Prenatal Development. Development Through Early Childhood. Individual Differences: Intelligence, Personality and Social Behavior. Troublesome Behavior. Glossary. Index.